Prof. Maathai has assisted women in planting more than 40 million trees on community lands including farms, schools and church compounds. In December 2002 she was elected to Kenya’s parliament and from 2003 to 2007 Prof. Maathai served as Assistant Minister for Environment and Natural Resources. She is internationally recognized for her persistent struggle for democracy, human rights and environmental conservation. In 1984 she received the Right Livelihood Award. 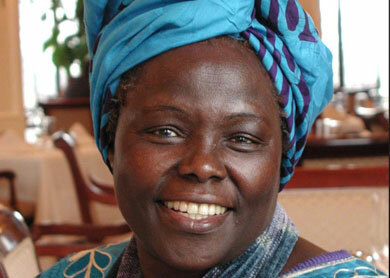 20 years later she was the first African woman to receive the Nobel Peace Prize. In April 2006 the French President Jacques Chirac honoured Professor Maathai with France’s highest honour, the “Légion d’Honneur”.